Third in a series. Part one is here. Part two is here. If printed newspapers were discontinued, there would be several reasons for publishers to worry about whether they could sustain, let alone grow, the traffic on the websites that would become their primary business. One of the biggest reasons to question the potential for standalone newspaper sites has been identified by Greg Harmon of Belden Interactive, who since 2001 has polled 300,000 newspaper website users in 250 markets across the country. In his work, Harmon has discovered quite consistently that fully two-thirds of the visitors to newspaper sites say they visited the site because they are readers of the print newspaper. This suggests that newspapers have taken good advantage of the strength of their brands and the visibility they command in the markets they serve. But what would happen if the print product went away? A case could be made that website readership would rise, because readers would have few, if any, other places to get local news. However, it is unlikely the vacuum created by the disappearance of the print paper would remain unfilled for long. As new print and online media moved in to compete with the standalone newspaper site, the newspaper site, stripped of the advantages that formerly differentiated it from all other rivals, would become just one of thousands of URLs competing for attention on the busy, noisy web. Fighting to gain visibility, traffic and advertising, a standalone newspaper website would be burdened by the second major problem turned up consistently in Harmon’s research: Young consumers, who represent the future of any media business, spurn newspaper websites. Year after year since 2001, Harmon reports, the average age of newspaper website visitors has been rising as the number of readers under the age of 35 declines. As of 2007, half of newspaper site visitors were 45 or older. By comparison only 34.4% of the U.S. population is 45 or older, according to the latest data available from the U.S. Census Bureau. On the other hand, the number of younger visitors to newspaper sites is falling. While 46% of newspaper site visitors were between the ages of 18 and 34 in 2001, the number dropped to 27% in 2007, according to Harmon’s research. Fly-bys, which represent about a third of a newspaper site’s traffic, are people who were referred to the newspaper’s site from a link at Google, Digg, Drudge, Huffington Post or someplace else. They drop in long enough to glance at a specific article on the newspaper site and then are gone. They are not the same as the loyal readers prized by either print or online advertisers. The fly-by phenomenon explains why the Newspaper Association of America reported an average 12.3% increase in unique visitors to publisher websites in 2008 but only a 2.4% increase in the time that visitors spent on the sites. Industry-wide, time on site last year averaged 44 minutes and 1 second per month, or less than 1.5 minutes per day in a 30-day month, according to the NAA. In the aftermath of the presidential election, which generated tons of extra traffic for all manner of news sites last year, the time spent on newspaper sites has fallen considerably. 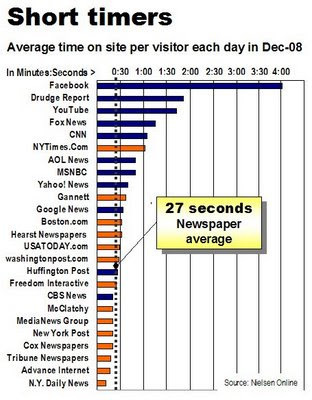 Statistics from Nielsen Online, the same independent agency the NAA used to prepare its report, show that the average time spent on the 13 largest newspaper websites in December was only 27 seconds per day vs. the 1.5-minute average reported by the NAA for all of 2008. As illustrated in the table below, the average engagement at newspaper sites trails significantly the time spent at places like Facebook, Drudge Report, YouTube and even the top two cable news networks. While it may not be fair to expect people to devote as much time to a newspaper website as they spend socializing on Facebook or watching videos at YouTube, the substantial difference in the level of user engagement demonstrates the profound failure of newspapers to create the sort of products that would attract young readers to their websites. The inability of newspapers to connect with younger consumers matters, because the consumption patterns set today will influence the future prospects for readership, regardless of whether the product is delivered in print, on a computer screen, on an iPhone, on a Kindle, on ePaper or on whatever gizmo emerges as the next big thing. If the interactive products produced by newspaper companies lack relevance and appeal for younger consumers, the economic deterioration of the industry will accelerate as older readers literally die off. The reason young people don’t gravitate to newspaper websites is that most sites are more newspaper than web: staid, static and largely un-interactive. Modern users expect to personalize their experience by picking the content they consume and choosing when, where and in what medium they consume it. They want to interact with a site (and other visitors to it) by posting original thoughts, commenting on the thoughts of others, ranking articles and voting on the credibility of a story and even its author. In other words, 1995-style shovelware won’t cut it. Before newspapers stop their presses in perpetuity, they need to fast-forward to the interactive age. Really, really fast. Next: Can newspapers make the digital transition? Fly-bys - I call them One Hit Wonders - are still extremely useful. First, though not as prized as readership, a site can still measure and sell this traffic. National branding and contextual ads, like AdSense, work well here. Second, they are the pool from which a site recruits a more valuable readership. But only if, as you say, they are provided with interesting ways to interact with the site. Logged in users see more expensive locally-targeted advertising. Finally, they serve as a direct measure of a site's SEO success. More traffic = higher ranking on Google = better dominance of the local web. That's the tick. If you can dominate, you can monetize. Statistics from Nielsen Online, an independent agency, show that the average time spent on the 13 largest newspaper websites in December was only 27 seconds per day vs. the 1.5-minute average reported by the NAA for all of 2008. I'd be wary of using one set of data to make a point about another set, especially given the wildly-different methodologies and results from Nielsen and NAA. Most of the independent metrics firms are wrong in some way, but at least they're internally consistent; cross-comparing them, though, may give you unreliable conclusions. Also, even though the increase of time-on-site was smaller than the unique-user growth, that the time increased at all -- even while the set of heavy-users was being diluted by the "flybys" -- is, in fact, a positive marker. I'm not entirely convinced that "young readers" want to be able to customize the content they want to read and that they don't visit newspaper sites because they are to "newspapery" and static. Based on lots of informal "sitting back and just listening" to the 18-25 crowd, most just really do not care about the news at large. All the newspaper has is "objective news" whereas Drudge, Fox, YouTube has salacious details about the gutter parts of our society, delivered in the most opinionated and sensational format. Most 18-25 year-olds are badly informed about daily events happening in the world around them. And they are perfectly happy to be willfully ignorant. Not sure how daily newspapers can deliver serious journalism to this crowd without resorting to a page six girl. The Kansas City Kansan doubled online traffic as soon as the print edition went away. Yes, Tim, you are right that it is not good practice to conflate data from two sources. In fact, the NAA report is based on data from exactly the same source. I have fixed it in the body of the post. Alan, thanks for this series its really valuable stuff. As a 20-something avid news consumer I can just caution personally that the weak traffic numbers are very largely a product of terrible websites, not an inevitable attention-span/low-switching-cost dilution of being online (though there's obviously some of that). Just off the top of my head two of the biggest sins are that they still follow the "wall of text and links" page design, and they are largely just repurposing newspaper articles word for word in an "everything must be 500+ words and restate all the facts that a follower of this story already knows" mode. It creates a signal-to-noise ratio both in browsing the site and in actually trying to read the articles (or follow an rss feed) that is simply well below what we've grown accustom to. My overall point is that while you make some good arguments that there is risk of online traffic downside if newspapers go online-only, I think there's a very large potential upside if they were to focus enough on the medium to do it well. The only question left at this point is will incumbent papers pull it off or will creative-destruction startups eat their lunch. Maybe I'm reading things wrong, but it doesn't sound right to me to claim that the number of young users has dropped based on the statistic you cite. As I read what you've written, it sounds like you're suggesting that _share_ of young users is way down. That may be the case, but if the overall user base is higher now than in 2001, couldn't the number of young users actually be higher? For instance, what if traffic has tripled? Fifty percent of 1 million is 500,000. 33 percent of 3 million is 1 million. So, while the share drops from 50 percent to 33 percent. The number has doubled. Latimes.com has claimed a 125% growth in unique users in the past year, so I don't think I'm nuts expecting to see large enough growth to outpace the drop in share over a six year stretch. And, I'm not an expert or anything, but -- besides overall growth -- shouldn't we also expect an aging of the user base to correspond with general graying of the Internet as connectivity went way up across the country? According to this recent Pew study, more than 60 percent of Internet users are now over the age 33. I can't find a stat to back this up, but I suspect that's an increase over 2001, when my personal memory of is that the Internet was still a mystery to many older people I knew. Let me know if I'm misreading something, but those are the things that immediately jump to my mind. I implicitly disagree with Greg Harmon's report. Our site, in a top #3 DMA market has grown unique users and their depth and time on our site. We have experience to know that our online audience is younger than print, not a duplication of print subscribers. Also, In the past, and currently, when our industry attempts to grow online audience by placing house ads in our print product to drive traffic online, the results are nominal. Very interesting stuff -- have really been enjoying this whole series. My one question is whether newspaper sites should really be focusing on younger readers, as opposed to focusing on readers, period. Great work, Alan. A treat to read this sort of analysis. Unfortunately, it reaffirms what I have long contended about younger readers: they are plain not interested in newspapers. Quantcast data shows a steady decline for the Kansas City Kansan, with no increase around the time they stopped publishing the paper version. There was a prediction ahead of time that it would double, but the publicly available data does not so far suggest that has happened. plenty of companies are making money publishing content on the web. weblogs inc, gawker and many other blog networks are successful. the problem i see with media companies is that they don't know how to build a successful website from scratch. some of their newspaper sites are successful, but only because of their established brands. very few newspaper and local media companies have successfully established a new web enterprises that weren't leveraging their local brands. acquisition was an option- about.com seemed to be a great buy for nytimes, but the newspapers have no money. I think the question has to be asked: What if the "news" as the news industry generally understands it, has no value to the potential younger readers? "News" to me has always meant informing people about community events and happenings, telling stories about interesting local people and watchdogging local government. It is what I learned as a young writer and what I have done most of my adult life. Perhaps that really has no value to the younger crowd. Or at least not enough value for a company to make any money trying to sell it to them or for a writer to try to earn a living explaining it. Maybe journalism as it exists will be missed more when it is gone. "When did the City Council decide THIS?" "Why are my taxes paying for THAT?" "Who was arrested for WHAT?" "Didn't there used to be a way to find out about this that wasn't word of mouth?" I have to say again that the premise you begin with, "if printed newspapers were discontinued," is flawed. Perhaps this is intended just as thought excercise, but why go through the motions? Serious reinvention at newspapers would not cut out print altogether, nor would it incrementally eliminate one day at a time as some are doing -- the optimal solution is probably a single, strong weekend edition distributed Friday, plus a variety of print niche products. You're absolutely right about the sites being more newspaper than web. The solution to that, as you suggest and I've been preaching, is for news organizations to figure out social networking. The graphic (minutes per visit at various web sites) is instructive and important -- but in the end it's probably a distracting metric. Averages can hide as much as they reveal. I know, I know, the NYTimes shows almost a 1-minute average stay -- but the point is the same: the reported average duration figures for newspaper sites likely attests to hordes of fly-bys. These folks aren't reading the electronic paper to stay abreast of what's happening in their local communities -- they're reading some BS info-tainment story. That's not what newspapers and journalism were designed for -- and it would be a race to the bottom (for them and our society) if they chased that demographic. Ask yourself: Would it be a smart 'business model' for a metro newsroom to assign reporters based on the subject or celebrity with the highest number of Google searches in the past 12 hours? There goes reporting of City Hall, the state capitol and all sorts of important stuff. We'd be left with the equivalent of 'reality TV': cheap to produce fluff. But on further thought, it doesn't surprise me. Maybe I hold a bias and certainly I'll admit I'm a Luddite re: social networking sites, but the graphic seemed to suggest that visitors to Facebook were really only "watching themselves in the mirror" (even if not admiring their own site). They were communicating with "like others". So, if my hypothesis is correct on that point, these visitors were not seeking NEWS, but rather some form of community and companionship. Thus comparing the average duration of visits to Facebook with the NYTimes websites suffers the apples and oranges problem. We're seeing *two* (at least two) mediums at work here: traditional news delivery and newfangled Web 2.0 communities. Don't confuse the two. They don't *directly* compete with each other (is Facebook really a news content producer? ), but given that the minutes one spends at Facebook or You Tube isn't available to be spent at the NYTimes, they do compete in a real sense: for the 'bandwidth' of a reader's mind. If the average reader prefers to spend a majority of his/her time on Facebook rather than with his local newspaper, then is there much journalists and newspaper editors can do about that? It seems that's the $64 billion question here. Facebook strikes me as more of a party-line telephone connection, a meet-up place -- not a news broadcast (or broadsheet). It's really a different medium. So don't get too distracted by it. John, I'm looking at something far more reliable than quantcast: Our own data. "John, I'm looking at something far more reliable than quantcast: Our own data." And yet no source or link is provided. Whenever someone cites public information and someone with an agenda says, "No, that's wrong. Trust me," then provides no source, I tend to go with the sourced info. I learned that lesson from years of listening to designers say: "We attract readers by the THOUSANDS!" Yet no info backs up their claims. They keep chanting the same thing again and again, with the hope it will one day be true. This claim sounds similar. Lots of chanting. No facts. No facts + agenda = no credibility. I absolutly agree that the technical attributes of web papers have to be changed. The next generation does not relate to the news in any traditional way. But I also think that the news media is going to have to redefine what it considers news. Typical "headline" news holds very little of interest to this generation and they do not seem to mature into conventional thinking. What is more relevant to them; some major disaster in a forign country or the latest issue of whatever techno thing is hot? The hardest pill for news media to swallow just may be redefining what is news! Redefining whats in the news is a lot bigger job than you think. Our media only looks for bad things to report on, how often do you see reports on community service efforts? We just dont praise good behavior like we should. Personally i do not spend time on newspaper sites but instead news sites, like msnbc, fox, and cnn. This is where people are really going for their news. It will be really interesting where newspapers have their place in the future. Your correct Tim if you can dominate you can monetize...I love it. I complete disagree with everything you've seemed to point out. Being that I'm a 24 year old woman who both watches and reads the news, I find your comments to be ill-mannered. I am not "ignorant" about the news and I know plenty of adults my age who know the same, if not more, about what's happening in the news than you do. Sorry to break it to you, but we don't sit and watch videos on youtube all day, nor do we discuss what's happening on Gossip Girl in our spare time. Newspapery...really? Maybe this is how you were when you were in your 20's and I'm sorry to break this to you...but times are changing.